Love & Live your Hobbies......: Best out of waste. Hello there, you all must have understood what I will be saying in this blog. How to make a different craft work with a used, or leftover products. In this blog I am sharing with you a picture to make your own paper bags, design as you like, make paper flowers, butterflies, for that matter any new idea you invent. This one is specially for my lovely friend chinu, who is very much excited to learn art and craft ideas from me. Though she is very much talented herself, but rarely agrees to it. So lets get started firstly, you will require few things to make your very own paper bag. 3. Once the box is formed glue the ends and then pack one end. 4. Stick the packed end thoroughly, and cover it with piece of cardboard. 5. To make handle for the bag, use punch machine to make hole. 7. Lastly, use thread for making handle for bag, putting a tight knot with in the bag. Note: If you think of making colourful paper bags, use poster or water colour paint to give different effects and texture to your paper bags. Make sure that colour is properly absorbed and the paper is dried before you start making your paper bag. 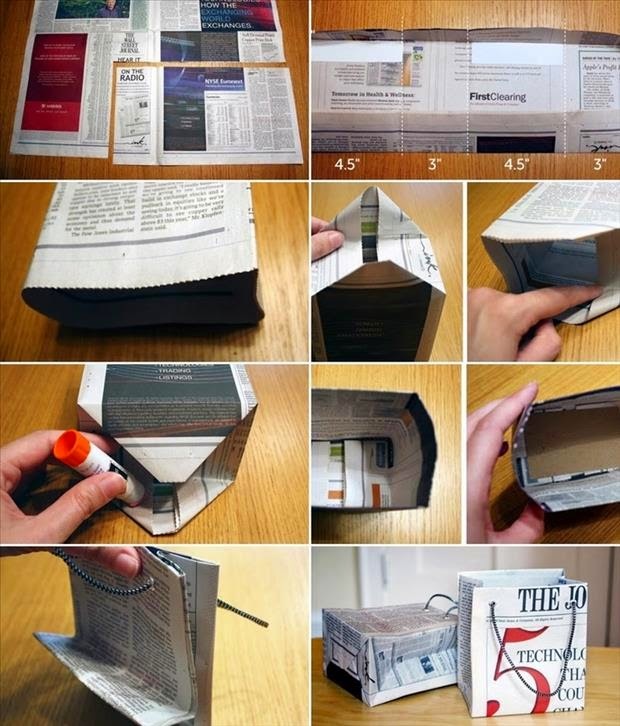 Your Newspaper handbag is ready to use. In India we don't have this system of using paper bags, but it is very use full in our daily lives. Its high time we all stop using harmful plastic bags and use paper bag instead. We all want our house, society and area to be clean, but as a individual we lack participation. By doing small changes around us such as using paperbags instead of plastic bags, we are saving our nature mother. So if you want see change around you, you have start making change yourself and motivate others to do as well. Our Project work going in on chennai region kindly update the boom lift rental in delhi member.